Juan Mata scores from the penalty spot. MANCHESTER UNITED MADE Manchester United made it five wins from five under Ole Gunnar Solskjaer with an unconvincing 2-0 victory over Reading in the FA Cup third round. First-half goals from Juan Mata and Romelu Lukaku were enough for the home side at Old Trafford, although the nine changes made to the team that won at Newcastle United left them looking largely disjointed. Reading, who sit 23rd in the Championship, enjoyed 60 per cent of the possession and had 13 shots to United’s eight, although a comeback never truly looked likely. The downside was the fact Alexis Sanchez had to go off 64 minutes in, having apparently hurt the hamstring that kept him sidelined throughout December. 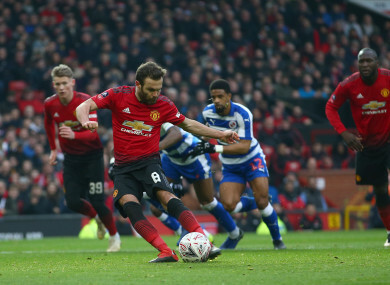 Mata dispatched a cool penalty – his first FA Cup goal since the victorious final of May 2016 – after referee Stuart Atwell penalised Omar Richards for a foul on the Spaniard following a VAR consultation, with Fred’s strike having been disallowed for offside in the same move. It was harsh on Reading, who had started better, and they should have been level when Danny Loader made a mess of a one-on-one with Sergio Romero after Lukaku was denied by Anssi Jaakkola at the other end. Andy Yiadom was denied by Romero at his near post as United continued to struggle, but a stray pass from John Swift proved costly in first-half injury time, with Lukaku rounding Jaakkola to make it 2-0 from Sanchez’s throughball. Solskjaer handed youngster Tahith Chong the chance to impress off the bench and was then forced to take off Sanchez, who indicated his troublesome right hamstring was again causing him discomfort. Sone Aluko was denied by a good save from Romero, but United were mostly comfortable in the closing minutes as they secured their place in next Monday’s fourth-round draw. Email “Fifth straight win for Man United as Mata and Lukaku book FA Cup passage against Reading”. Feedback on “Fifth straight win for Man United as Mata and Lukaku book FA Cup passage against Reading”.